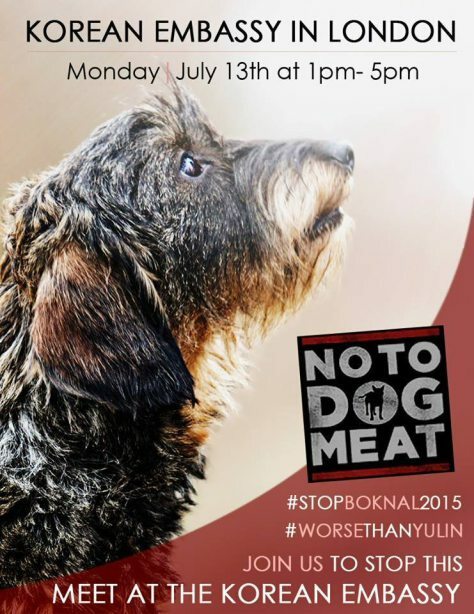 #StopBokNAl2015 London Korean Demo Monday! On Monday (13th July) NoToDogMeat will be outside the Korean Embassy in London shouting as loud as we can! Can you be there too? The dogs and cats will appreciate your presence, please join us. Julia De Cadenet will be present to lead the protest. Next Chinese Rescue #707 Tianjin Day 4 379 Dogs Counted.